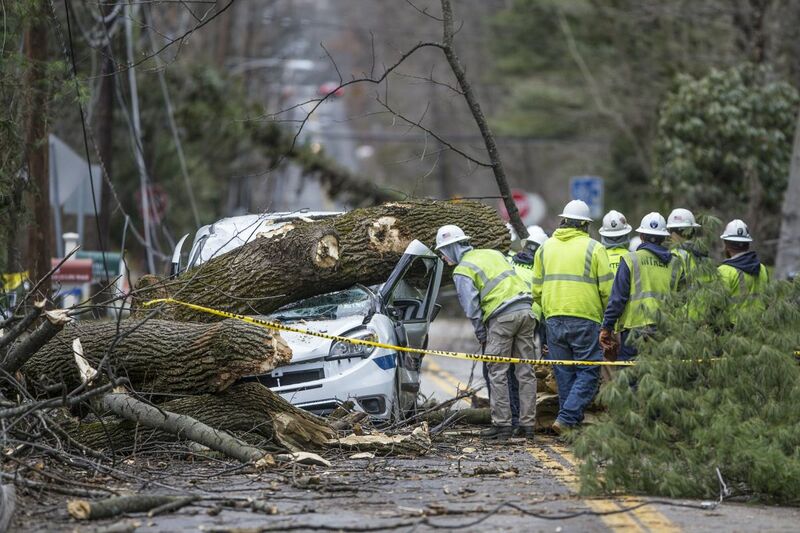 Electrical workers from INTREN, a Chicago-based electric company, survey the damage to a vehicle that was struck by a falling tree in Bryn Mawr. A second nor'easter is taking aim on the Philadelphia region even as parts of the area continue to recover from last week's coastal "bomb." The National Weather Service says the storm is expected to develop off the North Carolina coast and intensify as it moves northeastward, bringing high winds and a mix of rain and snow to the region Tuesday night into Wednesday. The storm is likely to affect both the inbound and home-bound peak commuting periods on Wednesday, the National Weather Service said, A winter-storm watch has been issued for 6 to 10 inches of snow in the immediate Philadelphia area. One positive: The winds are not expected to be as strong as Friday's storm, when gusts of up to 62 mph were recorded in the region, and 71 mph at the Shore. Nor are they expected to last as long. Winds for the latest nor'easter are projected to be in the 15 to 25 mph range, with gusts of 35 mph. Still, with the ground drenched from Friday's storm and more precipitation in the forecast, it may not take much to topple some already-weakened trees. Friday's storm caught everyone by surprise and proved to be harsher than expected inland, leaving hundreds of thousands of homes and businesses without power and paralyzing SEPTA. The current forecast calls for four to eight inches of snow west and north of the Philadelphia region. Upper Bucks and Montgomery counties are included in a winter storm watch that includes Northeastern Pennsylvania and North Jersey.